If you’re looking for an alternative analytics service to Google Analytics, you should consider Adobe Analytics. One of the best paid services, it uses artificial intelligence to track users and depict customer journeys. The cloud-based software has a number of useful features, all of which go beyond anything you’ll receive with a basic service. Adobe Analytics allows you to track users over a variety of different channels and devices to map out comprehensive customer journeys. Utilizing machine learning and artificial intelligence, it goes beyond what you receive through basic web analytics services. You’re able to do much more with Adobe Analytics than just measure visits, page views, and clicks. With fallout, flow, and pathing analysis, the service provides you with the information you need to understand your customers and personalize experiences. Plus, reports are delivered in real time, which means faster insights than with many other services. 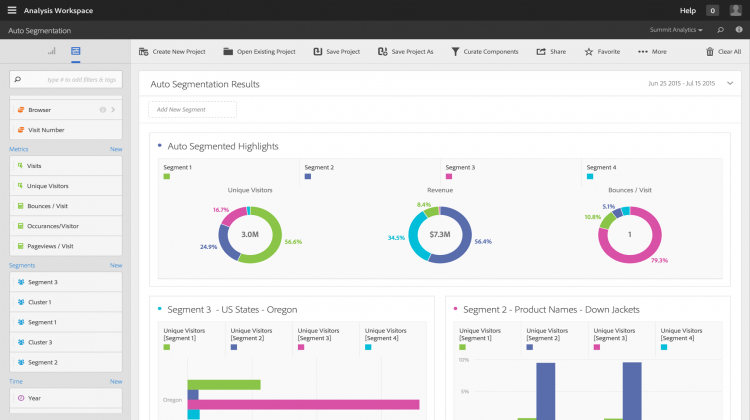 With Adobe Analytics, you can create segments that mean something to you. For instance, you can base segments on a single data point or a number of data points. The service can turn data about these segments, as well as about your entire audience or an individual, into intuitive visuals. This is valuable for collaboration across departments and for preventing silos. Adobe Analytics goes beyond offering data about website activity — it also provides you with marketing analytics to help you learn more about your customers and to ensure that activities are leading to returns. You can use insights to enhance experiences, taking factors like device, location, and time of day into consideration. To ensure that you are always seeing the full picture, you can integrate with third-party data services. You can input data relating to both online and offline channels, including mobile, video, social, email, paid search, voice, direct mail, radio, and television. Measuring across all these channels ensures that you are seeing the complete customer journey. You can then make improvements to every stage: from awareness to consideration to acquisition and, finally, to retention. To improve your strategy going forward, you must know how much credit to give to each touchpoint. For this reason, Adobe Analytics offers attribution modeling based on advanced statistics. This is available out of the box, thanks to a number of built-in attribution models, all of which are simple to implement. Adobe Analytics also offers retroactive event processing for a long time span. This enables you to create profiles of new customers that include their previous behavior. Again, this is applicable for a number of online and offline channels. Anomaly detection. Artificial intelligence is able to pinpoint the most important anomalies. It also identifies which spikes and drops are likely to be statistically significant. Contribution analysis. Using machine learning, Adobe Analytics is able to determine probable causes for changes and anomalies. Segment IQ. Another use of AI is to generate segments that make sense, based on where your target audience differs on the most critical metrics. Intelligence alerts. Receive an alert whenever a statistically important event occurs. Live stream triggers. Another type of alert you’ll receive is when a lead abandons a process that would lead to a conversion. You can then follow through with an email or text message. To take this a step further, Adobe Analytics even offers propensity scoring to inform you how likely it is that the visitor will return. Live stream visualization. A final live feature is visualization. This helps you predict behavior as a user is acting, allowing you to respond in the most appropriate way. Adobe Analytics is a strong competitor for Google. From the nine reviews it received, the service gained an average rating of 4.1 stars and 78 percent of users said they would recommend it. Google Analytics only fared slightly better — with an average rating of 4.5 stars and 88 percent willingness to recommend. However, Adobe Analytics did receive lower scores on all four of the main criteria: for product capabilities 4.6 stars compared to 4.7 stars for Google Analytics, for core processes 4.3 stars compared to 4.7 stars, for basic use cases 4.5 stars compared to 4.7 stars, and for additional capabilities 4.3 stars compared to 4.5 stars. Adobe Analytics was most commended for its simplicity in tracking and analyzing. Users also praised the service for the variety of tracking options available. The biggest criticism it received was for its global support team, who were said to be unhelpful in the migration process. For instance, users rated the quality of technical support as 3.6 stars and ease of deployment 3.5 stars. With its range of built-in features, significant capabilities, and easy-to-use platform, any marketer or data analyst looking for the right solution should check out Adobe Analytics.